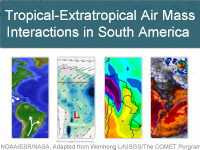 Case studies of tropical-extratropical air mass interactions over South America are presented in this module. Synoptic features associated with cold air intrusion into tropical latitudes and the incursion of humid, tropical air masses into midlatitudes are identified. Conceptual models illustrate the synoptic environments and the role of the Andes in the meridional movement of air masses. Forecast challenges are presented for different periods of each case. Finally, the weather impacts associated with these contrasting air-mass incursions are explored. I thought that the black and white surface and upper-air maps were a little difficult to read with the small text/numbers being hard to see at times. Good course - of particular interest to me because I've lived in South America and understand the impact of both tropical and extratropical air mass movements over there. I enjoyed doing this module one morning during the 2014 world cup in brazil. the overview of cimate and synoptic regimes was interesting and very informative. This is an informative module covering meridional flows in South America. There are not many MetEd modules focusing on South America and this is a welcome addition. Two representative scenarios are covered with a fair amount of detail. I'm surprised this is tagged as a Level 1 module, not Level 2, as previous understanding of jet streaks and atmospheric rivers would benefit the student.